Melbourne Scrap Metal Removal & Recycling | 1800-GOT-JUNK? Nobody likes to have piles of excess junk lying around their home or office. 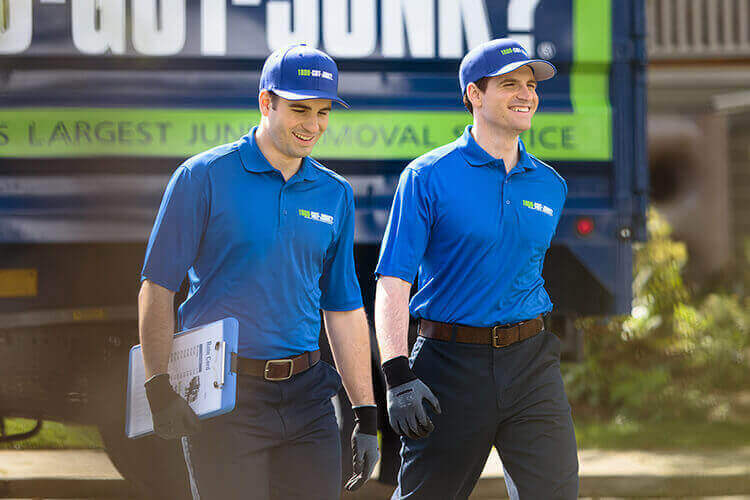 Here at 1-800-GOT-JUNK, we are the world's largest junk removal service, and we are proud to offer our services to clients throughout Melbourne and the surrounding areas. When you need to get rid of junk quickly, we are the ones to call. We're in your neighbourhood, so we can dispatch a team to your location to haul away your junk right away. We have been in this business for decades, so we know exactly what we are doing. We work with both residential and commercial clients to help with all their Melbourne scrap metal removal and junk removal needs. Show us what we're up against. We can just about guarantee you that we've seen it before and removed it with ease. While many people choose to hire a skip for junk removal, this is not the most efficient way to get things done. You'll have to deal with an ugly skip sitting in front of your home or office until you get the job done, and you'll have to do all of the heavy lifting yourself. However, when you work with us, you can just point and junk disappears! We are highly skilled at what we do and will get rid of your junk as quickly as possible so that you can get back to your regular life. It's amazing how much junk ends up in our landfills each year. Not only is this incredibly costly, but it is also quite harmful to our environment. Here at 1-800-GOT-JUNK, we truly care about preserving our environment for future generations. That is why we recycled before it was cool. If you need scrap metal recycling or other junk recycling services, we are happy to help. Even if you aren't quite sure if something can be recycled or not, we'll be glad to figure it out for you. We'll sort through everything that you ask us to haul away and will always recycle anything that can be recycled. If you have items that are still usable, we will even donate them for you so that someone else can get some use out of them. We have worked hard to put together our team of the best junk haulers in the Melbourne area. All of our team members are highly experienced and will get your job done quickly. We understand how important your time is to you, so we guarantee that we will show up to your location exactly when we said we would. If there is even the slightest chance that we will be late, we will alert you right away so that you always know exactly what is going on. You can expect our workers to show up in clean, fresh uniforms and with a clean truck. We want to present the best image possible while hauling your junk away. We also offer a complete customer satisfaction guarantee, so don't hesitate to let us know if you have any concerns or feel that we have missed anything. We'll do everything we can to address the issue as quickly as possible. It can often seem like you are living in a nightmare when you have piles and piles of junk that you just can't seem to find the time to get rid of. You don't have to suffer like this anymore! Call us right away and we will send someone over to clear it all out for you. You'll be amazed by how great it feels to live your life clutter-free. Once we have finished, you can take a deep breath and say, "Goodbye junk. Hello relief". Call us today to schedule an appointment and make the junk in your home or office a thing of the past.